Tell Us Your Story of Re-Invention! Two Nights Only at the Darkhorse Theater 4/17 & 4/18! This year’s GRRRL Scholarship fundraiser was inspired by an advertisement during this year’s Super Bowl, which asked 100 million viewers across the nation to consider, “What does it mean to do something like a girl?” Run like a girl. Throw like a girl. Fight like a girl. Every example revealed one startling reality — “like a girl” was never a good thing. 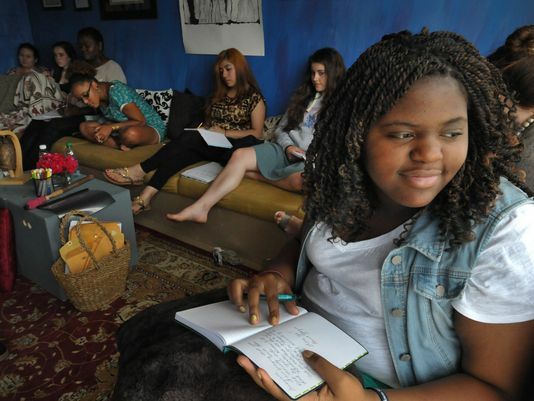 Healing Waters Productions (HWP) is honored to support Act Like a GRRRL* (ALAG), Actors Bridge’s autobiographical writing and performance program, where teenage girls write about their lives and transform their thoughts into public performance. ALAG has spent the last decade exploding the box that traps young women into a constricted and destructive definition of what it means to be a girl in our society and empowering them with the tools to live bold, authentic lives. HWP Founder, Cynthia C Harris, has been supporting ALAG as audience member, ally, and guest artist since its creation in 2005 by Vali Forrister. HWP supports ALAG’s mission to empower teenage girls to explode the box in which our society can limit them. If you’re wondering about the effectiveness of the program, to date, 100 percent of our graduates have gone to college. There is no reported truancy, unwanted pregnancy or drug abuse among participants. In short, this program works! 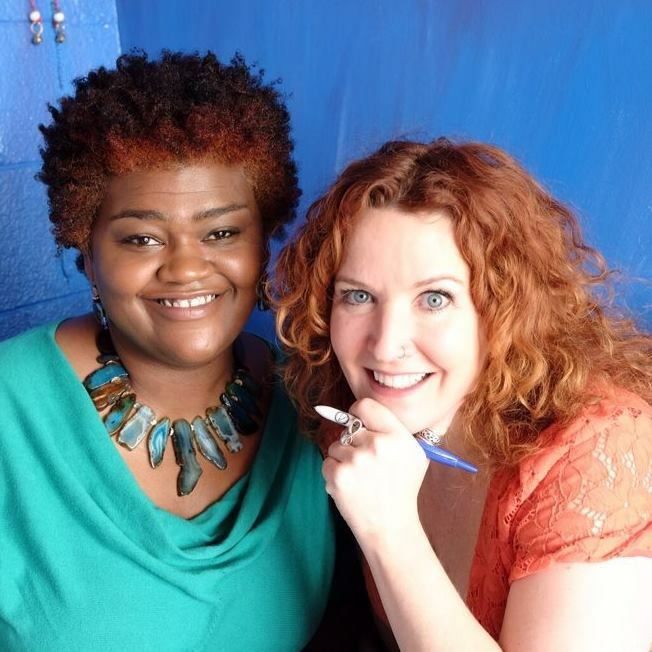 The fundraiser is directed by Actors Bridge Company Liaison Rachel Agee and Artistic Director/ALAG Founder Vali Forrister. The performance will feature a high-profile collection of musicians, actors, writers and cultural observers to define what it means to them to do life “like a GRRRL.” For two nights only, on April 17 and 18, they will speak, sing, dance, and shape-shift their stories to life as part of GRRRLS NIGHT OUT: an all star fundraising performance for GRRRL scholarships at the Darkhorse Theater, 4610 Charlotte Avenue in Nashville. HWP’s Founder, Cynthia C Harris, joins the cast including Kim Bretton, Amanda Card, Wendi Dalby, Caroline Davis, Cassie Hamilton, Gabrielle Saliba, Annie Sellick, Tasneem Grace Tewogbola, Abby White and Alicia Williams. Performance Schedule: Friday, April 17 at 7:30 p.m. | Saturday, April 18 at 7:30 p.m. Door Tickets (General Admission): $25. | Cash, check and credit cards accepted. *The Act Like a GRRRL summer session runs June 13-26, 2015. Performances are June 25 and 26 at the Belmont Black Box Theater, where Actors Bridge is a professional theater in residence. Tuition is $1250. Some need-based scholarships are available. 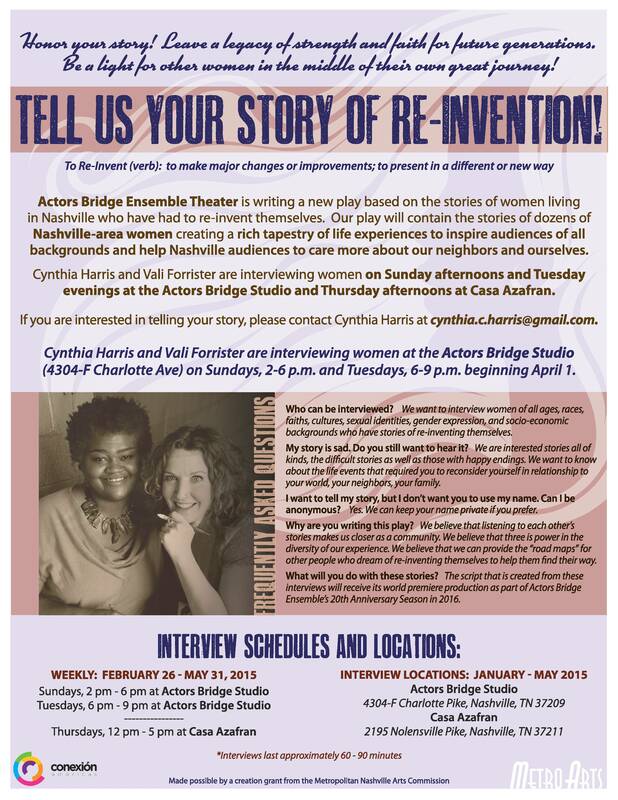 Thanks to a Metro Arts Creation Grant, Actors Bridge Ensemble has commissioned Artistic Director Vali Forrister and well-known local playwright Cynthia Harris to create a new play based on oral histories of women who have come to Nashville to reinvent themselves. The two are currently recruiting women interested in being interviewed as part of the project. In-person oral history interviews will last approximately 90 minutes and will be conducted between January and May, 2015. Interviews can be de-identified for those who wish to remain anonymous. The script that is created from these interviews will receive its world premiere production as part of Actors Bridge Ensemble’s 20th Anniversary Season in 2016. Through the generous support of Nashville Public Library, the oral histories collected through this project will be preserved in NPL’s Special Collections Center. Community partners in this project include Casa Azafrán, Conexión Américas and the Nashville Public Library. For more information about the project please visit our page! 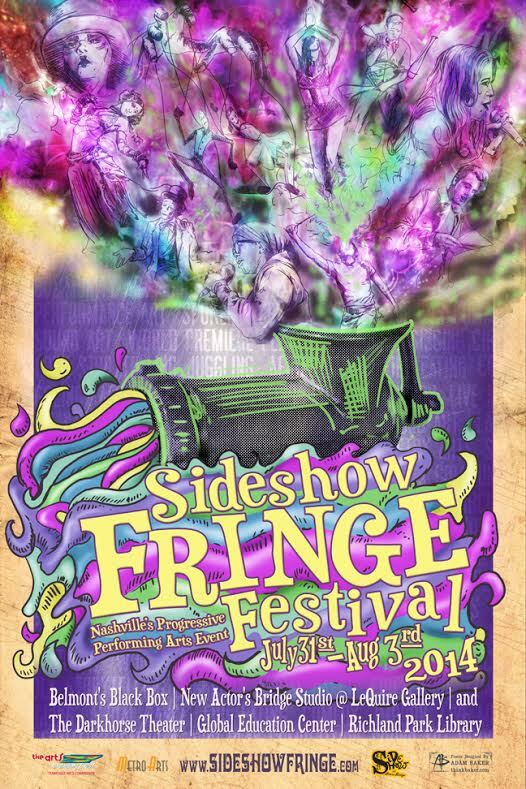 We are excited to announce that Healing Waters Productions will participate in this year’s Sideshow Fringe Festival, an annual event celebrating progressive performing artists in Nashville, TN. On Sunday, August 3rd at 4:30 pm, Healing Waters presents “Why Won’t She Leave?” – a salon style evening of participatory theater and dialogue. The audience members choose roles as we collectively tell the story of a young woman navigating the complexities of an intimate relationship. The performance contains some adult language and references to gender based violence. Sideshow Fringe Festival presents Why Won’t She Leave? Purchase tickets here ( http://www.eventbrite.com/e/sideshow-fringe-festival-2014-tickets-12202844035). The space inside Actors Bridge studio is immediately intimate. Cushioned benches line the walls, blankets are strewn about, pillows make each corner cozy, and hand-painted blue-purple walls complement a golden fabric ceiling. Harris was a guest speaker for local program Act Like a GRRRL, which aims to provide a safe space and community for girls to form their own voice and learn how to navigate being a woman through friendship, mentorship and the art of writing. 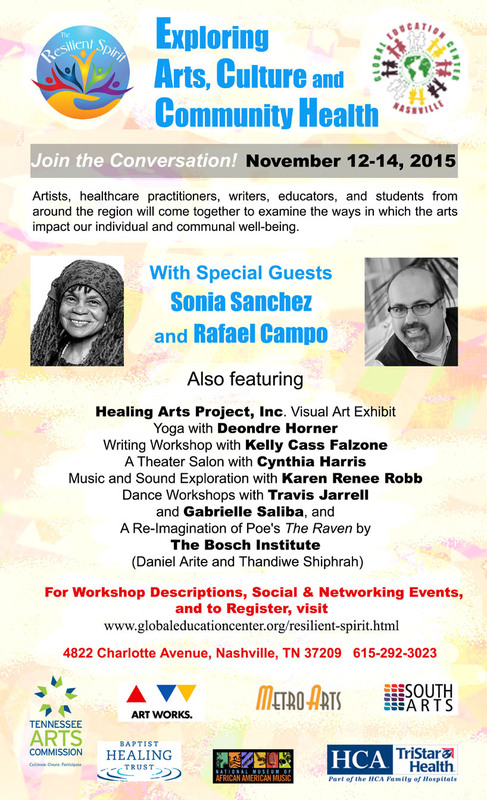 “I think anywhere women gather, there is storytelling and healing going on,” Harris said. Her mother was a hairdresser, and she spent much of her childhood sitting in the beauty parlor and listening to women share their stories. Act Like a GRRRL provides a similar environment to girls who are existing in a world where cyber-bullying and Queen B culture are the norm. Over the course of June, they create an original performance, including monologues, dances and a co-written song. This year marks the program’s 10th anniversary. Guest artists like Harris are brought in over the course of the program to show the girls that women can accomplish amazing things. Reach Journalist Paige Pfleger at ppleger@gannett.com| 615-259-8072 | Twitter @PaigePfleger. What: A performance that combines original, student-created theater, music and dance through the Act Like a GRRRL program.